Please read the update at the bottom of the post before commenting. Even though I was disappointed in Kubuntu 11.10 during my Live run of it, I decided to go on anyway and try to install it. Maybe the issues I have faced in Live run would not be showing themselves in installed system. Some features behaved differently in Ubuntu 11.10 installed and Live so far, that's why installation was a made deal. As in my Live run of Kubuntu 11.10, I booted my laptop (Fujitsu-Siemens Amilo Pi 1505) from DVD-RW with CD ISO image recorded. First of all, I tried to run installation directly from screen with Try - Install selection. It did no work for me. The reasons was that network was not on at that moment, and I saw no way to connect to wireless network at that screen. Installer runs through the same checks as Ubuntu - disk space, power and network, but there is no option to connect to wireless network at that point. Ubuntu gave me such option. As a result, I had to go to Live mode first and then run installation of Kubuntu 11.10 from Live run. Installation itself was very similar to Ubuntu one. The difference is only in window design/layout and slideshow. They are in Kubuntu 11.10 theme, of course. I had same issue as in Ubuntu 11.10 again. GRUB was installed without my request. To be honest, that is not 100% true. I was asked where to install GRUB, on which partition. I could select the partition for GRUB installation at that point, but not to cancel the installation. That's a pity. Another thing to note about installer is that progress bar during installation is something you should not trust. Values go up and down there easily for about 10-15%. It means you can never predict how much time actually left. Finally, all the installation steps for Kubuntu 11.10 were over. I could reboot the laptop. Forum on this blog - to be or not to be? Do you think that this blog needs a forum? There was a voting in that post. It's time to announce results. Unfortunately, there is not enough support from readers to start another venture - DarkDuck Linux Forum. That's why I made a decision to put this project aside now. I think comments are more than enough for this stage of blog life. In the meantime... If anyone still wants to see the forum, and is ready to be its administrator and moderator, I will be more than happy to help with domain name, technical arrangements and so on. Please leave your comments here if you agree or disagree with my position. Or if you volunteer to be forum administrator. Even if you had an option to run GNOME2 in previous release of Ubuntu 11.04, there is no more this option in 11.10. It is only shipped with Unity interface. Does it mean GNOME is fully gone? No, it is still here... But that's not GNOME2. 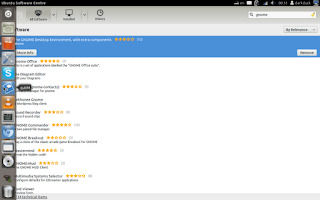 That is GNOME3, updated version which follows (or creates?) new wave of user interfaces. I have seen only one operating system with GNOME3 so far: it was Fedora 15. Let's have a look at Ubuntu 11.10 with GNOME3 interface and check whether it is better than Unity. Installation itself is almost background process, except for single question about login manager. You have an option to choose between GNOME's standard GDM and Ubuntu 11.10's standard LightDM. My choice was for the LightDM. So, my installation is over. It's time to reboot! Don't think that I decided to change priorities of this blog from Linux reviews to Video. I promise to return to that topic very soon. But this time I am going to talk about video player again. If you remember, my previous post was about VideoJS player, great open source library to extent possibilities of HTML5-compatible browsers. Today great resource Wazi published my post about Flowplayer, open source flash player for self-hosted videos. If you are like me then you were very excited about HTML 5's video tag. Simplistic, great functionality, and now it is even supported by all of the latest browsers. Video is just a source away, and easier than ever to portray high quality videos right on your website. HTML 5, like anything else, doesn't have everything we want. For example the biggest problem is a "full screen command." Even though you are able to specify the dimensions appropriately, you still want to be able to save space, and provide that option. Early on there were a number of options available to have a deluxe video player. There seems to be a frontrunner in this battle, and that is VideoJS. VideoJS is a free open source player that includes everything you need for your HTML 5 video. It features a lightweight, easy to use design complete with controls you would like, including volume and fullscreen options. It is supported by the latest browsers including IE9, and Opera. It even supports devices like iPad, iPhone, and Android. Another great feature is the automatic fallback to Flash that it features that will give you the same quality video for IE6,7, and 8. This is essential if you want everyone to be readily available to see your video. You also have the option to chose from various "skins" to get your video looking just the way you want it. If you have enough talent you can even create your own skin using CSS. Lets take a look at how all of this works. Even with the ease the VideoJS has provided, some may not see the need to use this. There are a few important reasons why you should be using an HTML 5 video player like VideoJS. First, you are able to reach a wide audience through the dynamic compatibility the HTML 5 video player has to offer. This will ensure that you are reaching mobile users, and users of various web browsers. Another reason is this video player offers the great features of an HTML 5 video tag, with the options of customizable skins, and full screen options. Then you can also add a fallback Flash player for browsers that do not support the HTML 5 video tag. This is done automatically, so there is no need to create a browser detector with corresponding hack. Finally VideoJS will be great for SEO. Google has a pretty big problem segmenting Flash videos, which makes it harder for you to be seen in the SERP's. You used to have to make extensive site maps, but now the video tag is easily identified, and you can even add a title to describe the media. If you combine this with a white hat link building service, you will defiantly have a boost in traffic. The VideoJS HTML 5 video play is an all in one solution to your video problems. You have cross browser compatibility, both with your videos, and with the look and feel. 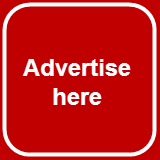 This allows you to reach a wider audience, and allows you to easily be seen by the search engines. This is the simplest way to have a fully function video player on your website, and even with the additional fullscreen option. VideoJS lets you incorporate fallback options for older browsers in the form of a complimentary Flash player. Try VideoJS once, and you will not be disappointed. Because my Live USB was broken, as you can see at the end of linked post, I had to use usual fall back option - CD-RW. The newest release of Ubuntu Operating System, Ubuntu 11.10, was released 5 days ago. Stir is settled down, and it is a time for me to try new flavour of African Humanity. To be honest, ISO image of Ubuntu 11.10 existed on my hard drive since the day of release. I downloaded it from torrent. Strangely enough, torrent tracker became unresponsive after couple of days of seeding. By that time my seeding ratio was well over 2, so my conscience was clear when I stopped seeding. Image size of Ubuntu 11.10 is about 700 Mb, which means it could be burnt to CD. So I did. But I did not spend much time in Live CD. Instead, I created Live USB using the Ubuntu built-in tool. Why did not I create Live USB directly via Unetbootin or dd command? Because I have already tried both of these options when was trying Kubuntu 11.10, and neither of those worked due to the BIOS on my laptop (Fujitsu-Siemens Amilo Pi 1505). So, Live USB was created. It is plugged into the port. Reboot. Choose to boot from USB. Let's go! First year birthday is over... It's time to give you presents! There were two competitions which ran on this blog for few weeks. Competition number one was for your artistic skills. The winner is Martik Panosian, who sent me this lovely logo, accompanied by variants for Twitter, Facebook and RSS feed. I will re-style the blog soon, using these artworks. Please contact me using same credentials as you used to submit your work, and we'll discuss your prize and delivery. UPDATE: Martik generously asked me to donate £20 to McMillian Cancer Support, instead of spending money on the book. Competition number two was for your social activity. The winner is Facebook user J***o. He will get 8Gb USB stick and CD with Linux distribution of his choice. First Runner-up is Twitter user B***M. He will get 1GB USB stick and CD with Linux distribution of his choice. 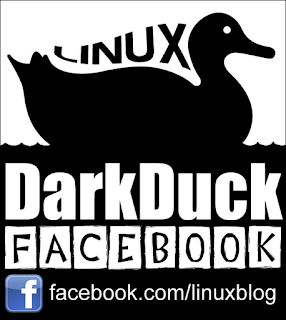 Second Runner-up is Facebook user E***s. He will get 1GB USB stick and CD with Linux distribution of his choice. I contacted all three of them via the available communication methods. Please come back to me with your contact details, so we can discuss details of prizes and delivery. If you don't claim your prize within 2 weeks, I will keep it for next contest. Many thanks to everybody who took part in the competitions! I hope you enjoy reading the blog, and will stay tuned after the competitions are over. It is very small age for human being, but significant time for the Internet life. Especially for the blog. There were ups and downs. Disappointments and wins. Good and bad articles. But the blog has survived. And it grows. Thank you all the supporters! I need you to write for! Thank you for all who does not like what I am doing. I need you to understand how I can improve. Thank you to all authors who posted on this blog. Thank you to all bloggers who allowed me to guest post. And, of course, all the presents and gifts are welcome! 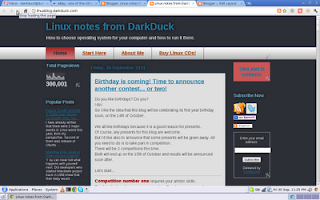 There are 2 times a year when all Linux users, and especially Ubuntu users, are excited. They are April and October. These are months when new versions of Ubuntu Linux are released. This October is not an exception. 13th of October (sorry, not Friday this time) saw release of version 11.10, nicknamed Oneiric Ocelot. As usual, Canonical, company beyond Ubuntu, releases whole family of systems based on the same core: Ubuntu, Kubuntu, Xubuntu and Lubuntu. There is a lot of new in Ubuntu 11.10 version. Especially because it is first system where Unity takes ownership of the system and moves old good GNOME2 fully aside. That's why it needs more detailed review. For the time being... Let's first have a look at little bit less popular, but still very good branch of Ubuntu which uses KDE as Desktop Environment: Kubuntu. It is also interesting for me since I am fan of KDE myself. I tried to download Kubuntu just few minutes after its release on the 13th of October. When I tried to do so, BitTorrent file with 32bit x86 version was not available on the server. 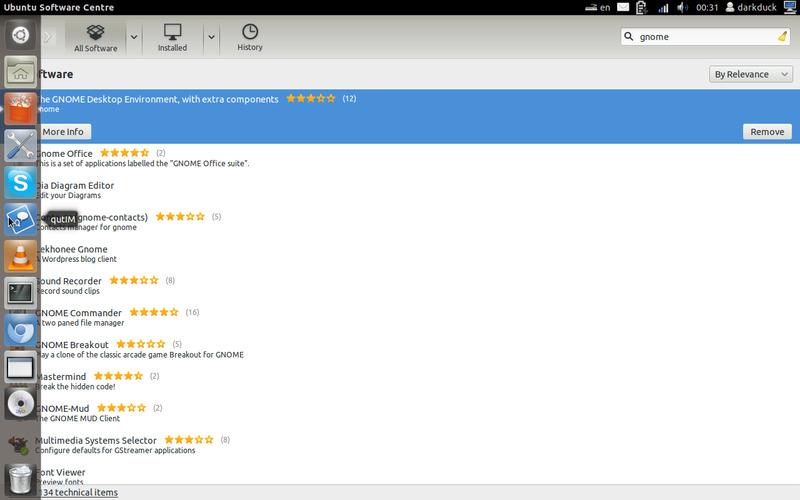 Such a pity, but that pushed me towards direct download link, which increased load on Kubuntu hosting servers. As usual, all Ubuntu releases fit standard 700 Mb size for CD, unless you want to go for DVD version specifically. ISO image was downloaded, and that was a time for me to attempt boot from USB using the image. Unfortunately, neither command dd nor tool Unetbootin were able to create bootable USB for my laptop. The same fault as with my previous attempt to boot Debian hybrid ISO image. It is a fault of BIOS on my laptop. As a result, I gave up with Live USB creation and burned ISO image to DVD-RW disk. Reboot. Choose to boot from optical media. Let's go for the Live run! Just over a week ago I announced a couple of competitions on this blog. 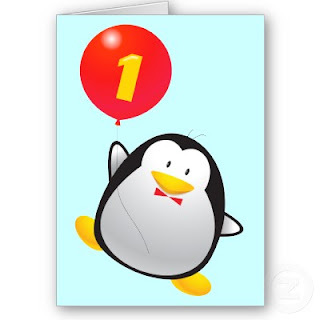 They aim to be celebration of First Birthday. Due to big success and number of participants, I'd like to increase number of presents which will be sent to winners. Competition Number One. It is about logo for this blog branding. Old prize was a book plus 1 Gb USB stick plus CD with Linux distribution. New, upgraded, prize is book plus 8 GB USB stick plus CD with Linux distribution. Book is any of your choice, from the Linux Blog Book Shelf, priced 20 GBP or less. Competition Number Two. It is about your social activity. Old prize was 8 Gb USB stick for winner and one 1 Gb USB stick for one runner-up. New, upgraded, prize is 8 GB USB stick for winner and two 1 GB USB sticks for two runner-ups. Of course, all winners and runner-ups receive free CDs with their favourite Linux distributions. Just to remind you... In order to take part in Competition Number Two, you need to either like Facebook page, or send a tweet with text below (it is clickable for your convenience). Competitions will close on 15th of October 2011, so please hurry up! I won't ask you if you know what Debian is. Surely you do. Instead, I'll ask you what Desktop Environment does Debian have? The most likely answer here would be GNOME. That is because GNOME comes as default for Debian. But of course such a Universal Operating System like Debian cannot have only one Desktop Environment available. If you look at Download page, you'll find other options there: KDE, LXDE and XFCE. Last two are actually shipped on same CD image. But the KDE one is most interesting for me because it was on the 4th place of users poll for best KDE distro, ahead of such KDE-centric distros like Pardus or Aptosid. Unfortunately, I could not review Debian Live before. Live images were released later than install ISO images of Debian Squeeze, and by that time I simply forgot about this option for Debian. Anyway, now it was time for me to come back to Debian Live project and get ISO image of Debian KDE Live. It weights about 1.1 Gb, significantly more that normal install CD. Debian Live can be downloaded in 2 types of ISO images. ISOs themselves are hybrid images which can be either burnt onto DVD or dd'ed to USB stick. Command dd is a method described in official documentation. Hybrid images require modern BIOS, which is unfortunately not the case for my laptop Fijitsu-Siemens Amilo Pi 1505. Even the latest BIOS with index 1.14 does not support hybrid images. That's why I had to use the second type of images with extension .img. Method of Live USB creation is the same: command dd. As a result of my investigations, I created both Live USB and DVD-RW. Both of them worked, but just for the sake of convenience, I will stick to DVD-RW option in this review of Debian KDE Live. So, ISO image was recorded onto DVD-RW.Reboot. Choose to boot from optical drive. Let's go! Last week was not usual on this blog. There were no articles written by myself specifically for my own blog. Instead, you could enjoy articles by other authors who wrote for me, or my articles published elsewhere. But the week is over. This is time now to finish. And the final accord will be pretty similar to the one at the beginning. If you remember, TechRepublic blog published my post a week ago: Six ways to use Linux Live CDs in your business. Today Guillermo Garron's blog published my post 4 Reasons to Have Live Linux at Home. Did you like the week of guest posting? Were articles published last week more or less interesting than usual content on this blog? Please leave your comments! Photoshop is without doubt the most well known piece of photo editing software. It is used by serious hobby photographers and professionals alike. However, although you can run Photoshop on a Linux machine by using a virtual box containing a Windows operating system, there are some good alternatives available on Linux. Unlike with the Windows or Apple operating systems, most Linux software is open source and so free to install and use. There is also a good reason why you should be wary of paying for some types of software on Linux. Here is our round-up of the best on offer. If you’ve looked into buying software licenses, you know that they can be expensive. Big Guns from Big Corporations charge a lot for their work - the work of their programmers, the marketing department, and so on. My laptop is very old, so old that many people don’t even remember the model. 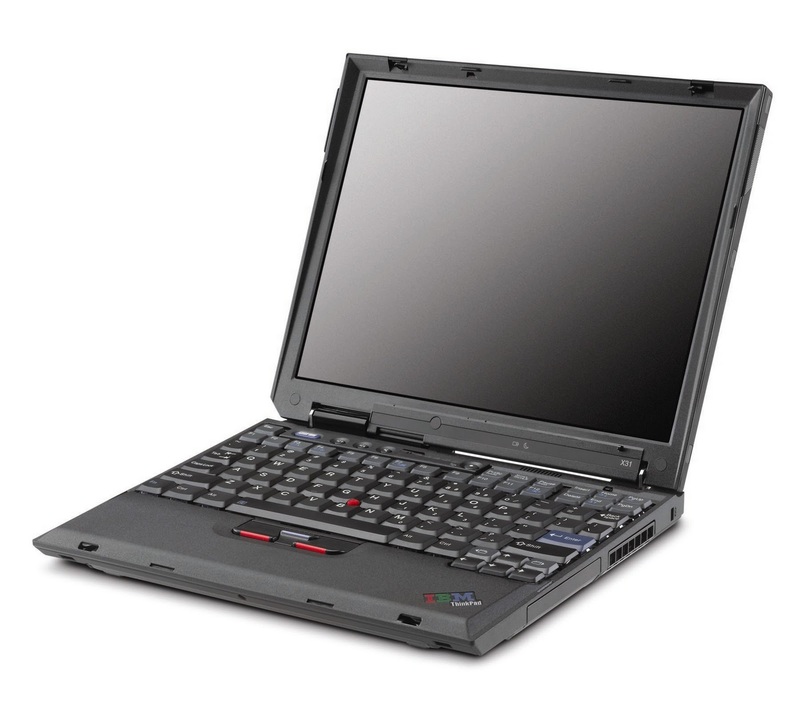 This is one of the last models designed and actually produced by IBM before it was sold to Lenovo – a good old IBM X31, upgraded to 2Gb RAM at the day of purchase in 2005. There is no single thing it cannot do for me – it works just perfectly for many years, and, perhaps, for a few years to come. I am also a dedicated Mandriva user since those times when it was known as Mandrake and was one of the two Linux distributions on the market – it means, since late 1990s. True, there were some interruptions in my love story with Mandrake (I cheated on it with Windows for a few years), but apart from that I was true and faithful to this distribution. So, what was the trigger that made me think about divorcing Mandriva? Let the week of guest posts begin! How did you use to see this blog? Couple of reviews from myself published every week. This week will not be usual then. Let me announce The Week of Guest Posts! Yes, this week you'll only see guest posts here. Either my article on other web sites, or different authors coming to write anything on this blog. To start with, let me introduce my article which was published today at TechRepublic. This is not the first time I got something on that respectable resource. This time round I published an article Six ways to use Linux Live CDs in your business. Ladies and Gentlemen! Welcome to read! And, of course, wait for more interesting articles! Please feel free to browse other articles on Linux notes from DarkDuck. This blog turned 100,000 pageviews on 28th of May 2011. Then 200,000 pageviews on 3rd of August 2011. 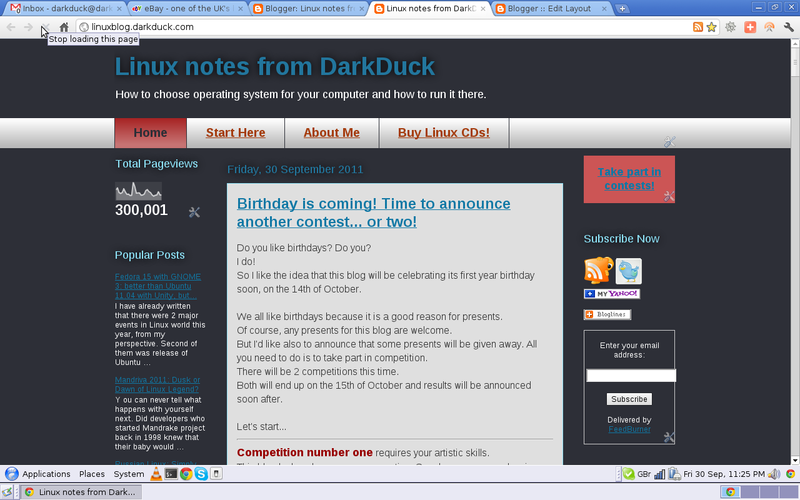 And finally 300,000 pageviews on 30th of September. Here is my own screenshot showing 300,001 on the counter. Date and time are shown in the bottom right corner. It is London time.